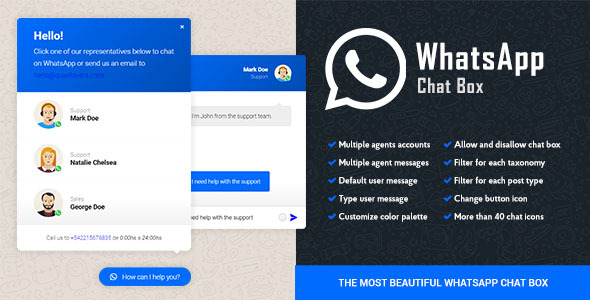 The WhatsApp Chat plugin allows your visitors and customers to send messages directly to you or multiple agents phone numbers. Our plugin allows you to include unlimited agent accounts with their names and labels inside the box to provide direct contact to the different support areas of your site. WhatsApp chat for WordPress allows you to include a chatbox for each agent where your users can type their first message. Customize the colors to match your site’s theme and the text to represent your main users’ language through the WordPress live customizer interface. Our plugin allows you to select between more than fourteen icons to include in your Whatsapp button.